The quality and durability of the luggage wheels is one of the most important factors to consider when choosing wheeled luggage. The benefit of wheeled luggage is their ease of use, so it is important to make sure your luggage has good quality wheels. You want luggage that will last you a while and broken or stuck wheels can seriously affect the life of your wheeled luggage. You can of course have the wheels repaired, but it can be tricky to find reliable local luggage repair shop, especially when you are traveling. Repairing the wheels does also cost, sometimes more than you might be willing to pay for an old and battered piece of luggage. When you are buying luggage with wheels there are many options to choose from, e.g. should you go for 2 or 4 wheels, should the wheels be able to turn or not, etc. Some of the choices are personal preferences only but there are at least four things we consider important to look at when verifying the quality of the luggage wheels, i.e. the wheels material, how easy it is to maneuver them, how the wheels are fasten to the luggage case and if the wheels are protected in any way. The best wheels are made of polyurethane, which is kind of high resilient flexible plastic. Most other wheels material, i.e. other plastics and rubber, either wears down too quickly or has too much rolling resistance. You should look for luggage fitted with in-line skate wheels. They are made of polyurethane and are the most durable and hardwearing luggage wheels available. It should be easy to maneuver or roll your wheeled luggage around. If you buy your luggage in a retail store, you can get a feeling for rolling an empty luggage case around. Bear in mind though that it can be quite different to roll it when it has been filled with your belongings. However if you are buying your luggage on-line you cannot do that so how can you make sure the luggage you like is easy to maneuver? If you choose good in-line skate wheels they should be complemented by good set of ball bearings, i.e. which aid the wheels in moving around freely and prevent jamming. Quality brand luggage with quality wheels system tends to be easy to maneuver. 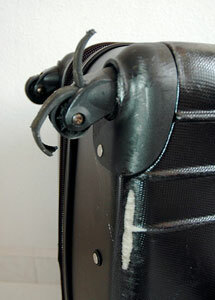 The wheels should be fastened to the luggage base with screws, not rivets. Screws have stronger hold, but as importantly, you cannot repair rivets while you can always replace lost screws. 4. Are The Luggage Wheels Protected? Luggage, especially check in luggage, has to be able to uphold some rough treatment. This is why wheels with some form of protection will last longer. The best protection is full corner protection, while partial protection is preferred over no protection at all. The protection material has to be hard to protect the wheels sufficiently, i.e. high tech plastics. When you are looking for luggage with the best luggage wheels, make sure they have in-line skate wheels made of polyurethane, with good ball bearings, are screwed on to luggage, and have full corner protection. All major luggage brands make luggage with in-line skate wheels. The range can differ though, but you should find these types of wheels in any wheeled luggage category. We suggest you search for the word “in-line skate wheels” when you buy luggage online. We at Top Travel Tips offer more advice on how to choose the Best Travel Luggage for you and your travel needs.